Adventure Why the Kenai Peninsula? 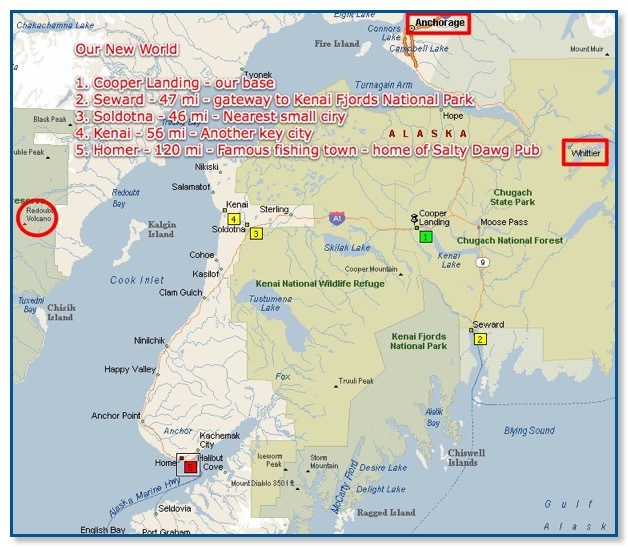 We settled on Kenai Peninsula because of our previous Alaska trip. In 2004 we went to Homer and spent 3 days in the area. In fact, we also went on a shuttle to Seldovia and had a fantastic time with puffins, otters, whales and myriad other great life forms. If you look at the map, you would be hard pressed to find many towns on the entire peninsula. 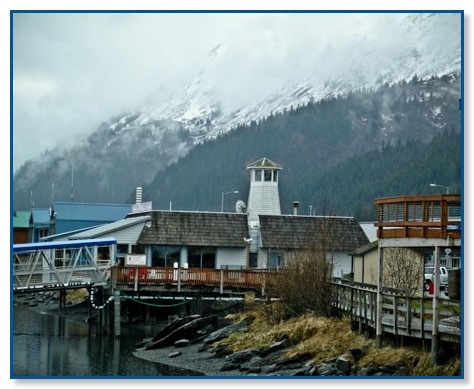 We selected Cooper Landing because it is an epicenter for salmon fishing and Alaska wildlife in general. We should expect close encounters with moose, bears (grizzly and black), elk, possibly wolves, bald eagles and an incredible variety of marine birds and other creatures. Also, Cooper Landing is centrally located. With that in mind, our first full day here, we decided to drive to Seward in the rain and cold - 39°. We needed to restalk some groceries and we had missed Seward in 2004. Our 47 mile drive was uneventful, but very pleasant not towing our 38 ft RV. 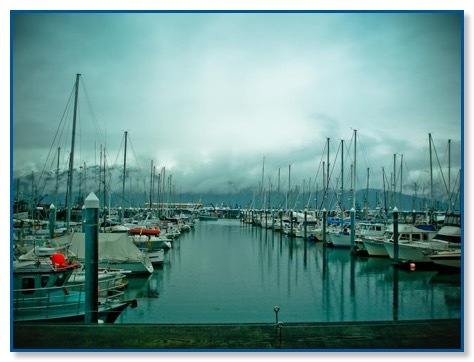 We could see through the rain and overcast that Seward is fantastically spectacular. Across the inlet, the snow covered mountains reach to the sky. Many fishing charters are chomping at their bits to get out and get some halibut. We can’t wait to get back there in the bright sunlight. After returning, Maureen made a fabulous pot of chili while I got our computer peripherals installed for our 5 months here at Wildman’s. Maureen is on the schedule for Friday, Saturday and Sunday. Although my shuttle driving doesn’t really get going until June, I will get some maintenance tasks to keep me busy. We’ll be posting significant events here in the new “Alaskan Adventure” section so why don’t you sign up for the RSS feed and share our experience? It truly should be an “Alaskan Adventure”.